No. 57, Jalan Batai Laut 5, Kawasan 16, Taman Intan, 41300 Klang, Selangor, Malaysia. 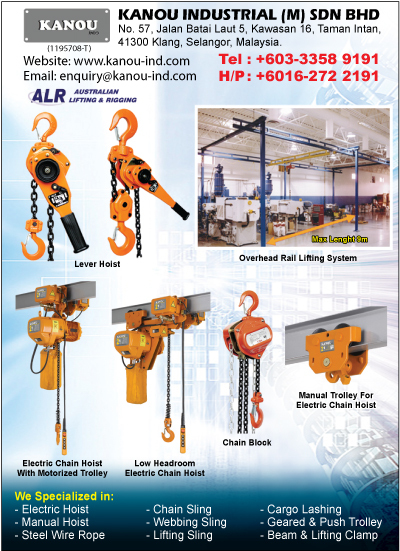 Kanou Industrial (M) Sdn Bhd is a leading supplier that offers full range of lifting, rigging, material handling solutions, personal protective equipment. We exist because of you, our customer. We aim to provide you with quality products, solutions and outstanding service. Kanou always practice “Quality Assurance” as our base fundamental. The knowledge and awareness that is being translated to every person who uses our products is equality important. By educating the masses on safety knowledge, we ensure peace of mind and overall well-being for every life that comes into contact with our products. Kanou supplies high performance products such as Steel Wire Rope, Wire Rope Slings, Chain Slings, Lifting Slings, Lifting Accessories, Manual hoists such as Chain Block, Lever Hoist and Personal Protective Equipment: Safety Helmet, Safety Shoes, Body Harness, Gloves and Eye wear.